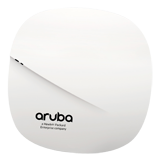 The compact Aruba 207 Series AP delivers a maximum concurrent data rate of 867 Mbps in the 5GHz band and 400 Mbps in the 2.4GHz band (for an aggregate peak data rate of 1.3Gbps). Featuring 2×2:2SS, and increased operating temperature, the 207 AP is designed for medium device density environments, such as schools, retail branches, warehouses, hotels and enterprise offices, where the environment is cost sensitive. With the integrated Bluetooth Aruba Beacon, the 207 Series provides advanced location and indoor wayfinding, and proximity-based push notification services while simplifying the remote management of battery-powered Aruba Beacons. It enables businesses to leverage mobility context to develop applications that will deliver an enhanced user experience and increase the value of the wireless network for organizations. Enables location-based services with BLE-enabled mobile devices receiving signals from multiple Aruba Beacons at the same time. Enables management of a network of Aruba Beacons. 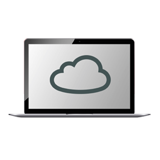 Supports priority handling and policy enforcement for unified communication apps, including Microsoft Skype for Business, with encrypted videoconferencing, voice, chat and desktop sharing. Adaptive Radio Management (ARM) technology automatically assigns channel and power settings, provides airtime fairness, and ensures that APs stay clear of all sources of RF interference to deliver reliable, high-performance WLANs. AppRF technology leverages deep packet inspection to classify and block, prioritize or limit bandwidth for over 2,500 enterprise apps or groups of apps. Controller-managed mode – When managed by Aruba Mobility Controllers, Aruba 207 Series APs offer centralized configuration, data encryption, policy enforcement and network services, as well as distributed and centralized traffic forwarding. Remote AP (RAP) for branch deployments. Air monitor (AM) for wireless IDS, rogue detection and containment. For large installations across multiple sites, the Aruba Activate service significantly reduces deployment time by automating device provisioning, firmware upgrades, and inventory management. With Aruba Activate, Instant APs are factoryshipped to any site and configure themselves when powered up.